Remember Mary Smith? She’s the woman who GOBankingRates dubbed “the Average American,” detailing what this person’s spending, saving and debt profile looked like. So now that we’re well into tax filing season, GOBankingRates is examining the average taxpayer — specifically, the average taxpayer’s bill from Uncle Sam and how it’s spent. And it’s a good thing, because it turns out only eight percent of people are totally confident that they actually know what their income tax pays for, according to our latest survey. According to 2012 data from the Bureau of Business and Economic Research (the most recent year available), per capita personal income is $42,693. This represents the mean income of individual U.S. citizens over the age of 15. The standard deduction for a single tax filer for 2013 is $6,100, which would reduce the above taxable income to $36,593. Per the 2013 IRS tax table, that would result in a tax liability of $5,073. Below, we break out how the average American’s tax bill would be spent, according to the most recent numbers provided by the White House. National Defense (24.64%): Includes salaries and benefits for military personnel, equipment and supplies, research, weapons and construction. Health Care (22.45%): Includes Medicaid, Medicare, CHIP program, COBRA tax credit, research and disease control. Job and Family Security (17.26%): Includes unemployment insurance, food and nutrition assistance and housing assistance. Net Interest (8.01%): Includes interest on Treasury debt securities. 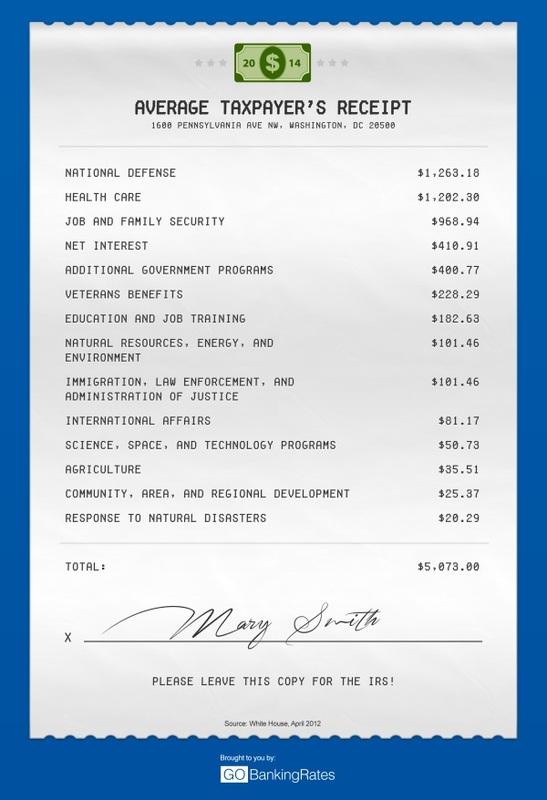 Additional Government Programs (11.38%): Includes spending on all other government programs, such as transportation and governmental administration. Excludes payment from Social Security and Highway Trust Fund taxes. Veterans Benefits (4.53%): Includes health care, income and housing support. Education and Job Training (3.30%): Includes elementary, secondary and vocational education, as well as financial aid and job training services. Natural Resources, Energy, and Environment (2.05%): Includes water/land management and environmental protection. Immigration, Law Enforcement, and Administration of Justice (2.05%): Includes border security, immigration enforcement and various activities related to administration of justice. International Affairs (1.72%): Includes humanitarian assistance, security assistance and foreign affairs. Science, Space, and Technology Programs (1.06%): Includes NASA and the Natural Science Foundation. Agriculture (0.65%): Includes research, crop insurance and agricultural subsidies. Community, Area, and Regional Development (0.48%): Includes the Community Development Fund, Operation of Indian Programs, Neighborhood Stabilization Program and Rural Water and Waste Disposal Program Account. Response to Natural Disasters (0.43%): Includes SBA disaster loans and FEMA grants. Just 8.5% of poll participants responded that they “strongly agree,” followed by “agree” (12.4%), “neutral” (29.7%), “disagree” (23.7%) and “strongly disagree” (25.7%). 49.4% of respondents don’t know what their tax dollars pay for. 20.9% of respondents believe they do know what their tax dollars pay for. 29.7%, the largest respondent group, were on the fence about what their tax dollars pay for. Men were slightly more likely to respond that they know where their tax dollars are going than women. Respondents aged 18 to 24 were most likely to select “strongly agree” than any other age group, at 13.2%. Study Details: What Does Income Tax Pay For? Females were more likely to select “disagree” than males, at 25.0% and 22.4%, respectively. However, males were more likely to select “strongly disagree” than females, at 26.2% and 25.4%, respectively. Men are more likely to believe they know where their tax dollars are going than women, with 22.7% of males selecting either “agree” or “strongly agree,” versus 19.1% of females. Of those making $100,000 to $149,999, 35.3% — the largest percentage — “agree” that they know how their tax dollars are spent. Similarly, 5.9% of the same income bracket, which was the smallest percentage, “disagree.” The same income bracket was least likely to “strongly disagree” that they know how their tax dollars are spent, at 17.6%. 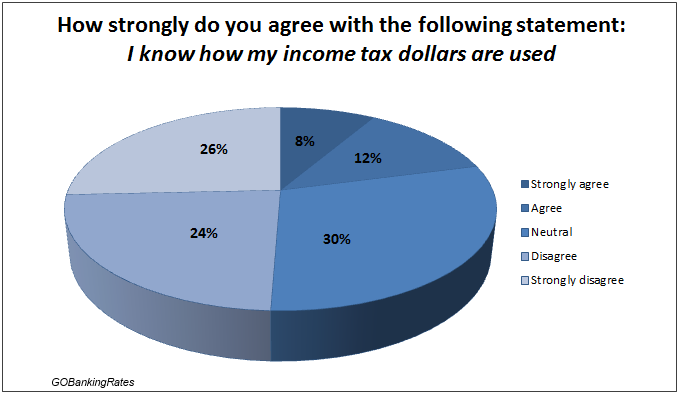 Of respondents who “strongly agree” that they know how their income tax dollars are used, 4.2% were from the lowest income bracket polled ($0-$24,999), whereas 50.0% were from the highest income bracket polled ($150,000+). Those who selected “strongly agree,” indicating that they absolutely know how their tax dollars are used, were most likely to be between the ages of 18 and 24, at 13.2%. This same age bracket was, however, least likely to “agree” that they know how their tax dollars are spent (7.0%), compared with 25 to 34-year-olds, who were the most likely to “agree” (16.7%). Of those who selected neutral, 37.0% were 18 to 24-year-olds, the largest group of respondents, compared with just 22.0% of those 65 and older, the smallest group of respondents. Those who selected “strongly agree” were most likely to be in the U.S. West, at 11.2%. Those who selected “strongly disagree” were most likely to be in the U.S. Midwest, at 28.1%. Those who selected “neutral” were most likely to be in the U.S. Northwest, at 32.9%. Of all population densities, urban respondents were most likely to select “neutral,” at 32.9%. Polling was conducted through Google Consumer Surveys from February 19 – 21, 2014 for a total of 1,501 responses with a RMSE score of 1.5 percent. Learn IRS payment options when you can’t pay in full.